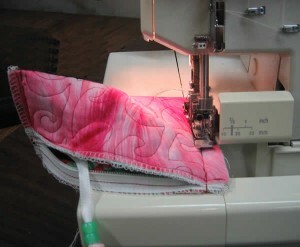 ← Creative quilt patterns that can utilize the AccuQuilt GO! Here at QuiltWoman.com, we have always known that the Humbug Bag™ is a popular item. A lot of people visit the QuiltWoman.com website as a result of searching for “humbug bag.” And we sell a good number of the patterns as a result. So I decided to make a Humbug Bag™ for myself and see what the excitement was about. Sew AND be a good citizen of our planet! No, I’m not talking about “green with envy”, although your friends may be when they see you whip up these cute bags so easily. I’m talking the “reduce, reuse, recycle” type of green. 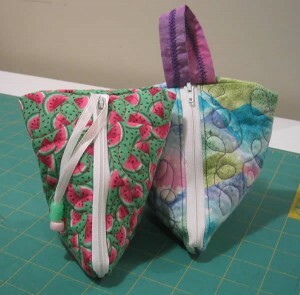 The Humbug Bag™ is a great way to get rid of scraps! 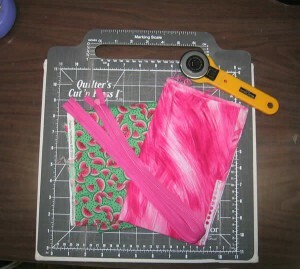 Depending upon the size you make (the pattern contains 3 sizes), you can use little or big scraps. The same applies to your piles of batting left over from bigger projects. So go find some coordinating scraps in your stash. And while you are using up scraps, dig through your zippers and find ones that are odd sizes (you can cut your zipper to the right length) or odd colors (pick your fabric scraps to match). Ok, you’ve got your materials in hand, now what? Make your fabric sandwich (lining, batting, main fabric) and pick a free motion quilting pattern that you’ve wanted to try but didn’t dare on a big project. 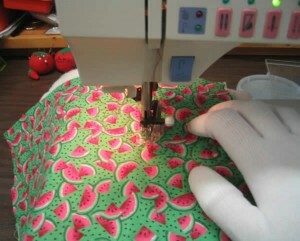 The Humbug Bags™ are small enough that any quilting mistakes are darn near invisible. Trust me, I know! So get creative. Try those flowers, swirls, leaves….whatever grabs you. And no, that is not Mickey Mouse doing the quilting in the picture above. I may have been called “Mickey Mouse” at some point, but actually I was wearing the best machine quilting aid I’ve ever come across. I’ve tried them all; gardening gloves with rubber dots, rubber thimbles, bare hands. All I ended up with was sore hands and a lousy quilting job. But I came across these gloves at my local quilt shop; these little beauties are called Machingers™. The finger tips are rubber, and the gloves fit tightly enough (better than those darn gardening gloves) to prevent slippage and they breathe!!! No more sweaty, tired hands! Below is my finished, uniquely quilted (politically correct for “not so perfect”) fabric sandwich. Now it’s time for some more creativity. Pull out that container of miscellaneous ribbon scraps and pick something to serve as a handle for your bag. 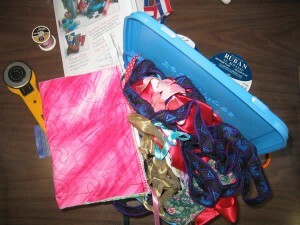 Ribbon stash – stored in an old diaper wipe box. 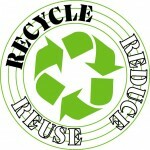 Reduce, Reuse and Recycle!!! I found some white ribbon that would do and then dug into the Girl Scout supplies and found some pony beads. Viola! A ribbon handle with an accent! Putting the bag together is a cinch. It stitches up quickly and with minimal effort. An hour’s worth of time (at the most) in your sewing nook and you’ll have a finished bag. • Gift tags that explain what a Humbug Bag™ is. • A page on Humbug Bag™ variations. All in all, I found this a terrific pattern to make. In fact, I had so much fun with it, I made a pile of them as “giveaways” for my daughter’s birthday party. She picked the fabrics from my stash that she thought best suited each invited guest. I found that as I was making the multiple bags, I started creating my own variations, not only utilizing beads but also creating my own “handles”. I also found places on the bags to stitch the name of each recipient. Finally, I filled the Humbug Bags™ with trinkets that usually go into party bags. I’m keeping this little pattern in mind next time I want to make a little gift for someone. It’s quick, easy, and frees up some room in my fabric bins, thus allowing me to run out and buy more fabric. And that’s reason enough right there to make a dozen or so Humbug Bags™! 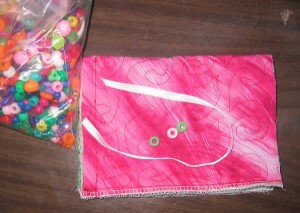 This entry was posted in patterns and tagged Humbug Bag. Bookmark the permalink.